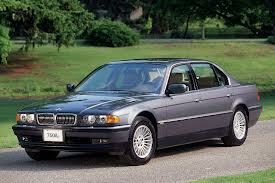 Is this 1997 BMW 750iL defective? US Specs is recalling one 2002 Porsche Carrera, one 1997 BMW 750IL, and two 1986 BMW 635 CSI vehicles for failing to conform to Federal Motor Vehicle Safety Standard No. 111, "Rearview Mirrors." While performing conformity-related modifications for the US market, labels with an incorrect size font were applied to the passenger side mirror. Drivers of these vehicles may not know the proximity of the objects in the passenger side mirror, increasing the risk of a crash. Got a lemon Porsche or a lemon BMW? Want a new Porsche Carrera or a new BMW?